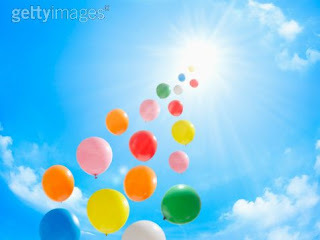 Floating balloons is a new creation of the author, this author, Ana. She stood up and thought that it will be much easier if humans beings could travel in a floating balloon all day long. She thinks that only if you get yourself into the air, and let yourself go, you will get that freedom you've been searching for so long ago. Ana imagines, she paints her dreams with millions of floating balloons, colorfuls, full of joy, hapiness, liberty. Each color has its meaning, each color is floating higher and higher. She grabs one, a tiny blue one, she holds it, and the balloon takes her into the air, into the sky above. She's flying, she is. She's seeing the people under the palm of her hand, she's melting the sky with the seas, blue. Then Ana begins singing, flying among the balloon. "When theres a shadow, you follow the sun. And for the heavens are those who can fly"
Only if you want to will you fly away."